The giant squid, Architeuthis, is one of the planet’s largest invertebrates. But agonizingly little is known about them, including their taxonomy, biology, and especially behavior. It was only last November, after all, that marine biologists were able to capture the first-ever footage of the squid in its natural habitat. 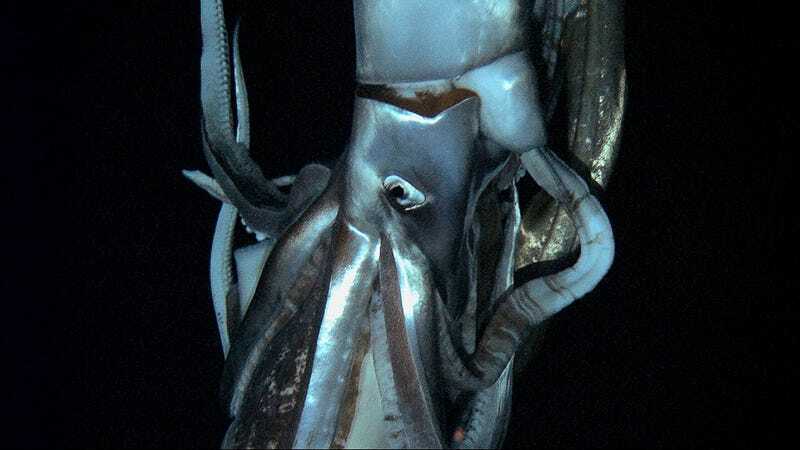 Looking to learn more, scientists from the University of Copenhagen, along with an international team of researchers from Australia, Japan, France, Ireland and Portugal, launched a project to understand how giant squid from around the world might be related. To do so, they collected over 43 tissue samples from the remains of giant squid (which were extracted from the bellies of beached sperm whales, stranded animals, accidental catches, and so on). They then performed a DNA analysis to get a better sense of their mitochondrial genetic diversity. What they discovered is that the genetic diversity of the giant squid is remarkably low (specifically, the results showed no detectable phylogenetic structure at the mitochondrial level and an exceptionally low level of nucleotide diversity). What this suggests to the scientists is that there is only one global species of giant squid — and with no population structure. "There's normally local distinction between [animals] genetically," Prof Gilbert told BBC Nature. "Things that live in one area eventually become different from things in other areas but [giant squid] are basically identical everywhere." Prof Gilbert described the findings as "very weird" but suggested that migration could be the key reason specimens from as far apart as Japan and Florida, US are genetically so similar. "We speculate the larval stage must drift globally in the currents then dive to the nearest dark, deep spot when they are large enough, thus stopping any [population] structure appearing," he explained. "Instead of the adults and their young living in the same place, the young distribute to a completely new place on the Earth every time." The analysis also shows that the giant squid have a substantial population, possibly the result of a recent population boom. Read the entire study at Proceedings of the Royal Society B. Images: Mark Norman via BBC.